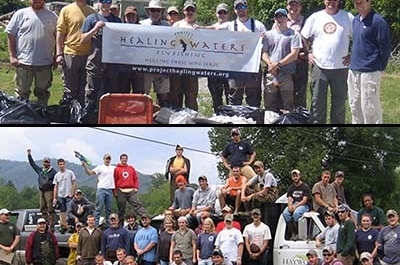 In 2009, Haywood Waterways started the Adopt-A-Stream program to help clean up Haywood County rivers and streams. Trash makes its way into waterways through stormwater runoff from parking lots, being tossed out of car windows, or directly dumped into streams. Trash can obstruct drains and cause flooding, clog water intake pipes used for agriculture and industry, and affect recreational uses, such as fishing, swimming, and paddling. Much of the trash can take hundreds of years to decompose, and some will never disappear. 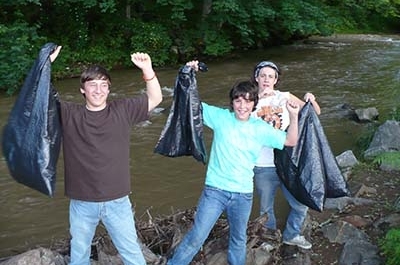 Commit to cleaning their adopted stream at least once a year. Commit to adopting their stream for at least two years. Reporting results after each clean-up to the Adopt-A-Stream Coordinator. 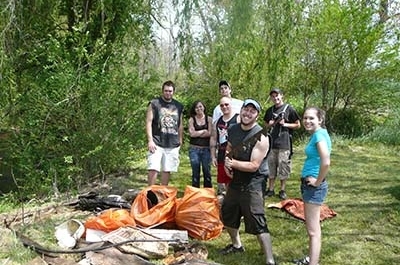 Results should include pounds of trash removed (estimated), number of volunteers, and hours worked. In return, each individual or group will have their name on an Adopt-A-Stream street sign posted at the bridge crossing closest to their adopted section. They will also be included in press releases, presentations, newsletters, social media and other public outreach efforts. To adopt a stream, contact Christine O'Brien, Adopt-A-Stream Coordinator.